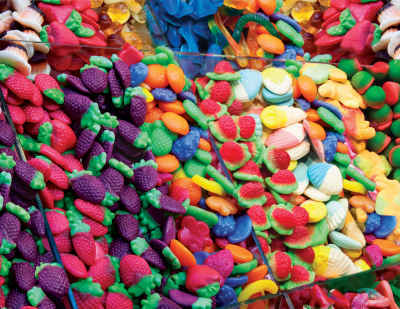 The more colorful the candy, the better the puzzle image it will make! Fruit Flavors is no exception to this rule, as the strong textures and patterns had one reviewer saying, "I love the color and the yummy deliciousness of the theme!" This 500 piece puzzle has the perfect amount of jumbled candies so it won't go together too quickly, but we think that it will only last for one sitting! This was one of the more difficult puzzles that I have put together. It took several night and sometimes I would have to walk away and come back for a fresh look. I love a good challenge. The puzzle was still ok because of the quality and various shapes of the pieces. But the image is completely out of focus, so it is just a blur of colors rather than pieces that show parts of what you think the picture is going to be. I wasn't happy with this one. It's only the second Springbok I have done where the image is so blurry, so I am not giving up, but I hope it doesn't keep being the case.